Call 1-800-846-7882 for a free consultation. 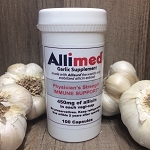 ALLIMED is considered physician's strength stable allicin, the most potent garlic supplement available today. We are ready to answer your questions and help you find a dose that works for your personal situation (one size does not fit all). The scientists and doctors who developed Allimed care about your health! They know that speaking with a specially trained consultant ensures you get the most out of their product. It is available as a liquid, a capsule or a topical gel formula. 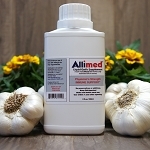 All Allimed products contain patented Allisure stable allicin. Not all allimed is the same. Buy the best allimed pills, allimed capsules, allimed liquid, and allimed gels on the web right here! Allimed Garlic Supplement Capsules - 100 ct.